Let me ask you one simple question? What keeps a blogger happy? Money? Yes, but there’s something better. A bloggers life revolve around traffic and there’s no point in blogging if you’re the only one who is reading your blog. Nevertheless, some friends or family members may visit and appreciate your writing skills, but it doesn’t make a lot of difference. We bloggers want our posts to go viral. We want hundreds of visitors visiting and reading our articles and leaving their views. But, not everyone achieves this. Due to lack of traffic, many new bloggers will close blogging and consider blogging as a waste of time. So, how do the top bloggers can bring thousands and millions of people on their blogs? They have some secrets and methods you never knew and applied. Today, let me present you with methods which will scale your current traffic (10-20 page views) to 1000+ Visitors/Day within your first month of blogging. I can’t promise the exact numbers as it is not a magic trick. However, depending on your consistency, you can easily cross the number and gift yourself a bigger goal. There are two categories namely on-site and off-site techniques. I’ve discussed both below. On-site is the one where you’ll be managing your blog for generating traffic. You’re responsible for taking care of things here and also you control the most part. Content is the king, and we cannot deny it. You will have to bow down to the king and present him with the best quality. Content is considered the major factor for SEO and SERP Results. Write longer, unique, and quality contents to rank your site in the search pages. FYI, 33% of search traffic clicks on the first result of a page. Optimizing your title for SEO and crafting catchy headlines for people are two different things. Your priority should be to craft a catchy headline which should grab users attention. After that, you can add a keyword in the title to make it SEO-friendly. This post will help you craft catchy headlines optimized for SEO. Visual contents are getting more popular recently, and you don’t want to be left out of the crowd. Add at least one high quality and colorful picture in every post you publish. It makes your post interesting, and people are more likely to share visual contents. Keyword research is the first step of article writing and SEO. Targeting multiple, low volume, long tail keywords will help you avoid the tough competition and still get visitors from search engines. Semrush is the perfect tool to find low volume and long tail keywords. You can get a special offer on pro pack of Semrush using this affiliate link. I have already talked about the importance of adding social media buttons in this post. These small buttons let your visitors share your content across different social media channels with ease which will help you get more traffic for free. There are 70% chances that your first-time visitors won’t visit your site back. If your domain name is non-brandable, hard to remember then these chances increases. (If you haven’t yet started blogging then you must read my guide to find brandable and easy to remember domains for free). What’s the solution? Retain your visitors. Collect their emails (or phone numbers) and make them visit your site again. Place subscriber forms and plugins at multiple places with beautiful quotes to attract visitors. Giving away some free goodies like an ebook or coupons have worked well for others. Always add links to some related blogs (or mention people) when you’re writing a new blog post. This tactic improves your website quality and helps your visitors find more information. Once you hit publish, contact the site owners and let them know you’ve linked their contents in one of your blog posts. This way, they are more likely to return the favor by linking your materials on their sites. Last but not least is to interlink your articles. Interlinking your articles will keep your visitors for a long time thus reducing your bounce rate. One thing to remember is that interlinking should look healthy and not forced. For off-site techniques, you’ll spend time on others site or social channels to attract their visitors. Here you don’t have a direct control on things but you can use strategies to turn things in your favor. Don’t hold back after hitting the publish button. Your real struggle starts now. Share your latest post to all the favorite social media channels and groups you’re a member. Facebook, Twitter, Google+, Instagram, and Pinterest are great for beginners. Blogging communities like ProBlogger & CopyBlogger are great resources for newbies. Also, it serves an important feature of cross-promotion. Similar to communities, forums are great ways to connect with like-minded people. You can either start your forum or join several forums and be an active user. Help users and add your links in a natural way. Do not spam. I repeat, do not spam. Trust me, everyone hates spams. Commenting, if done right is a friendly method of bringing the traffic. Comment on other blogs in your niche and drop your link in the ‘website’ section. Your comment should be relevant to the post or else it will be unapproved and deleted. Just join it. It works! You’ll learn everything all by yourself. It’s as simple as walking in a park. Guest posting may be time-consuming and difficult to implement, but it is one of the greatest methods of bringing traffic. When you do a guest post on a popular blog in your niche, you not only get a backlink but also reach to the audience and give them a new blog to read. One important thing to remember for guest posting is to write unique and good quality articles as you do for your blog. You collected emails, and it’s the time to use them. Email subscribers are considered as loyal readers. Promote your latest blog posts, special deals and offers, upcoming events, and other such stuff via newsletter. I use MailerLite to manage my email subscribers and it’s working like a charm. And it’s free for first 1000 subscribers. Questions and Answers (Q&A) sites like Quora and Yahoo Answers are popular places to bring traffic. Spend some time on these sites, respond to questions with honesty and link your site where possible. Do it naturally and not in a spammy way. If your answer is helpful, then people won’t mind visiting your site to know more. Enough with the online drama. You can promote your site and bring potential traffic via offline means also. Add your website URL to your business card and distribute them. Take part in bloggers meet up or business meetings and give your business cards to the maximum crowd. Also Read: Stuck on page 2? These 220 High Pr Do-Follow Backlinks will help you move forward. These are the simplest techniques you can implement to drive traffic from all over the internet. Again, it’s not a magic trick. Don’t just stick to your comfort zone and expect people to jump on your site. Work hard, stay consistent, be helpful and you’ll find your way to be a famous blogger. There are many more traffic tips which I’ll cover later in my upcoming posts or preferably an e-book (Yeah, I always wanted to write an ebook). Now get your a$$ working man. Go work and get your first thousand visitors a day. I agree with you. SEO strategies look easy on paper but when implementing, you’ll get stuck and have more doubts. The only way to be better at it is to practice new techniques and do experiments. Great post! Helpful and easy to understand. Thanks for sharing. Amazing! Thanks for good words and keep visiting. 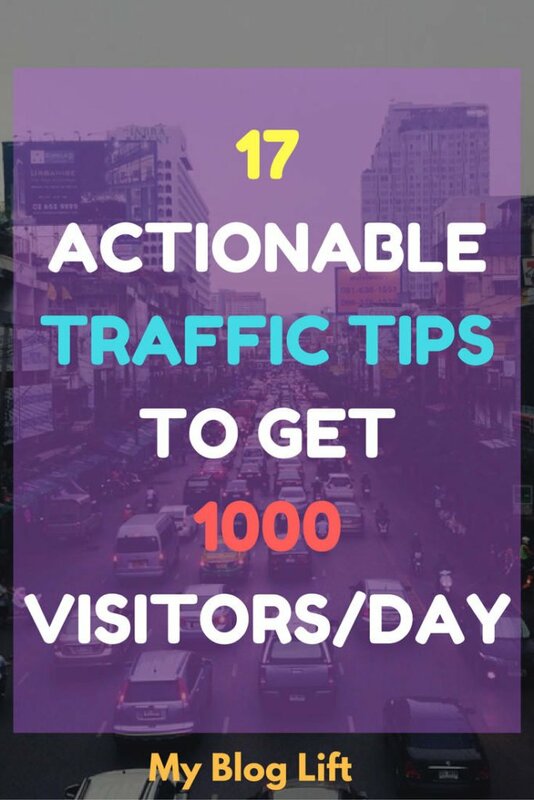 Great collection of traffic tips..its too gud for the seo beginners such as me…. Really I have learned a lot from your article Thank you for sharing with us. Hey Safi,I must admire your post.Its very useful for all those who want to grow up as a SEO executive.I have been working as an SEO executive and when I saw your blog I am impressed by reading your post. Thanks for amazing words Stephen. This post is pretty good! Thanks Yuda, Welcome to MyBlogLift. This is nice topic and i will instantly join with you. Nice post..will definitely try stumble upon. Thanks Deepak and Nice Decision.